Polydex is a hot and cold water system for potable water supply and distribution, sanitary water applications and heating systems. It is the first complete PPR pipe system in Pakistan that conforms to international standards. PPR is a food grade material and is recommended for drinking water applications. It is a corrosions free system which resists algae and bacteria growth. 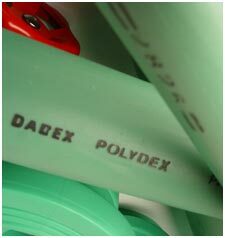 Dadex current manufactures Polydex for Hot & Cold Water Supply and Distribution, Air Conditioning, and Other Applications.